Hi Everyone. 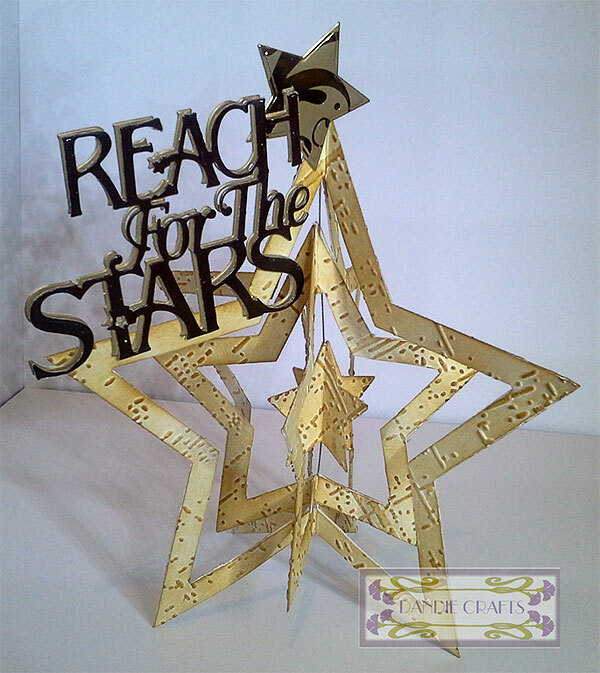 I have another Star themed project for you today but this time it’s free standing and 3D! I fancied doing something a little different this time. This is actually an easy project but it takes a little time to do as you have to cut multiple frames out and glue together but that’s all there is to it. Start off by cutting out (counting from centre die) four frames made from dies 9 and 7. Then cut 4 frames from dies 6 and 4. and lastly cut 4 solid pieces from die 2. Run all pieces through an embossing folder and ink over with Distress Ink. Score each star in half with point at top and fold. Glue the large framed together leaving on edge unglued. Repeat for the small frames and the solid star shapes. Cut a length of thin jewellery wire or ribbon and glue this through the centre of all the pieces . Make sure all edges are now glued into place. Before glue is completely dry twist the stars to face different directions. Trim any excess wire. Cut out the sentiment twice plus an extra star and glue these into position. See Mandy's original post on her blog here.